Many years ago, I got my first digital camera as a Christmas gift. I don’t remember the make and model, but I believe its max resolution was 3.1 megapixels (which seemed pretty high at the time – similar to how my 2GB hard drive seemed vast once). At the time, I didn’t know anything about photography – I anticipated using the camera to capture pictures of friends. Being the geek that I am, I of course read the manual from end to end. It was my eagerness to test out all the features I’d read about that lead me to set my camera to macro mode and approach a berry-laden bush that was in my path one day. I took several close up shots of the berries, but one in particular ended up being an absolutely amazing shot. It was perfectly composed so that the berries formed diagonal lines that were guided the eye around the image. It was perfectly focused so that the naturally occurring chaotic arrangement of berries appeared to form several distinct layers. 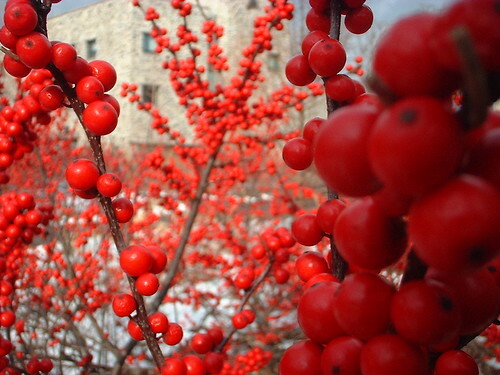 It was perfectly exposed so that the rich, red color of the berries was immediately drew a viewer’s attention. And, it was a complete accident. The berry shot was a very fortunate and significant accident. After taking a shot like that, how could I not want to take more? Of course I didn’t expect shots like that to always simply happen, so I started to research photography. I read everything about photography that I could find on the internet and I sat around in the Barnes and Noble cafe, taking notes on photography books that I couldn’t afford to purchase. Of course, I quickly determined that to really move forward in photography, I’d need an SLR. That same year, months after getting my first digital camera, I moved back to film. For my birthday, I got the cheapest, fully manual SLR that Ritz Camera had to offer. I did learn to develop black and white film (though I’ve forgotten all of that now) but I only had limited access to a dark room, so I did most of my shooting on color film. Fortunately, around this time, Snapfish.com came into existence and offered insanely cheap developing by mail. Despite this, I ended up spending tons of money on developing and camera accessories over the next few months. Gradually my film shooting slowed down, and eventually, as funds ran out, it stopped. Over the years since then, I’ve continued to learn about photography and to shoot with digital point-and-shoot cameras. I always went with Canon’s Powershot A line because of the many manual features the A cameras have, but still, a point and shoot camera does not offer the level of control that a true SLR offers. Recently, I finally got a digital SLR. Though I never stopped taking pictures, with the level of quality and control the dSLR offers, I feel like I’m making a return to photography. I’ve been posting regularly to my once-dormant Flickr account and I’ve been making connections with other photographers. I still have a lot to learn about photography and I am excited to learn it. I’d love to hear your story of how you got into photography. Let me know – post a comment.